Videos provide contractors an unique opportunity to stand out among their competitors since the majority simply do not create videos. It can be a video of a customer testimonial or an animated overview of different jobs. You simply need to incorporate videos as part of your marketing strategy. Most important is to realize the importance of Videos to help you create inbound lead generation opportunities. Yet there is a big difference in platforms that use Videos. First, let’s take Vimeo out of the equation since it doesn’t come close to that of YouTube and Facebook. That leaves Facebook versus YouTube. Each has their own advantages as a platform but only one wins for Videos supporting inbound lead generation opportunities. There are endless statistics about both. One platform has more views while the other has more quality view time. I care most about helping generate more organic (Free) inbound lead generation opportunities. Loading videos directly onto Facebook will not help get organic traffic. It may help get exposure but it doesn’t help give a boost to website SEO Marketing topics. Remember, Facebook and YouTube are in a battle for your videos, but Google is the king for Search and they own YouTube. You can still benefit from both platforms, one to help with SEO and the other to help videos be shared among friends. Post your videos onto YouTube with a strategic title with description, link to the webpage it references best on your site and tag it correctly. This helps with the goal of boosting organic leads to your website. Maybe create a custom thumbnail to replace the image YouTube randomly selects for the video. Then reference the video on Facebook (and maybe include the custom thumbnail) as part of a status post including a link to the video. This helps with the goal of getting your video shared among friends. When it comes to Video and generating leads, my vote is YouTube first, Facebook second and forget about Vimeo. My instinct is someone will eventually come to talk about why Vimeo is good for them, and that may be true. But Vimeo has its strengths as a video sharing website, and the theme of my post is focused on what is best to help a contractor generating more business. It is for that reason I limit my vote to YouTube first and Facebook second. Love this, couldn't agree more. Video is huge right now, saw a stat today that on mobile alone, in an average week, YouTube reaches more adults 18+ during prime time than ANY cable network does. AND it's free to post videos to Facebook or YouTube, you don't even need any special tech. Pull your phone out, talk about some roofing tips homeowners will find interesting, title and label it well as MOTB said, and boom you've got all kinds of eyes on you and your brand. It's easily one of the best free marketing tactics you can be doing right now. Driving leads for contractors through complete digital marketing solutions. Here's another consideration about the custom thumbnails …. All my videos have them as seen here. I plan to include these videos as part of communications to my prospects. In addition to the video being good, the image helps re-enforce whatever it is I am trying to express as a differentiator from my competition. Over time it will be very hard for a competitor to catch up with the volume of videos, and their clarity...and the cover looks good too. A great way to stand out while also helping with the lead generation topics too. The thing I like about the videos I post to YouTube is they rank organically extremely fast! I took your guidance for the new additions page I wanted to create. It has finished pictures along with before and during. And I included the schematics too. Got a customer testimonial video and you will not believe what it cost me. Check it out and then ask how much I spent on the edit. Love that feedback button! Thats how you reduce barriers to getting reviews. Well done! Good job and I can see you took many of my suggestions pretty well. I randomly checked some of the picture optimization and see it all done correctly. The video was done nicely too. I guess I have to play Price Is Right and guess $75. I totally agree, Brian. I think Youtube is one of the most underrated platforms out there for getting traffic. And because you're ranking an asset that already belongs to Google rather than trying to rank your own site, it's an easy way to add bulk to your numbers. I know for some business owners, they'll upload a video but they still have trouble finding it in the search results. It can be frustrating to have such good videos that no one sees. There's a free method I've been using to rank my clients not only on Youtube but also on the first page of Google search results, often within 10 minutes. 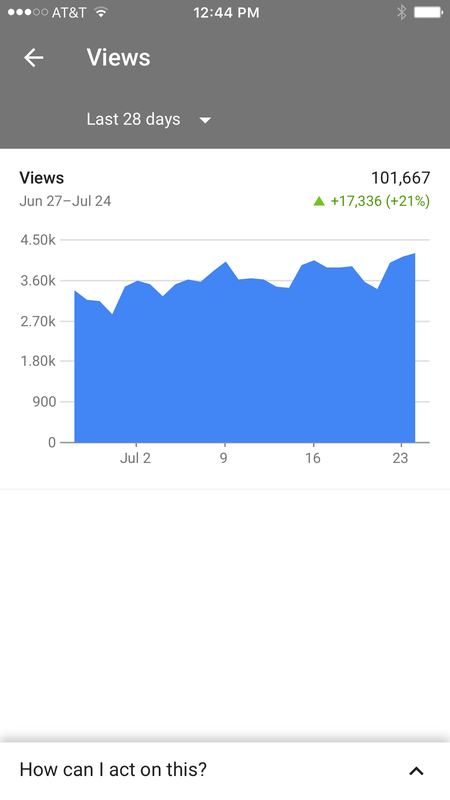 Using the same basic template along with Youtube Live and WireCast, I'll teach some of my clients to rank their own videos even if they have no knowledge of SEO. You can get more in depth, but here are the basic steps I've followed that have worked for me and which you can feel free to use yourself. Why a live event and not just a normal upload? I'm not exactly sure why this works so much better but it does, and it makes sense that Google wants to get live videos up as soon as they're cast. Does this affect the staying power of the video? Not in my experience, especially if you also share the video along with getting organic traffic. You won't actually be recording yourself live - rather you'll record your screen while your video is playing. Once verified, click on "Enable live streaming"
My keyword is "Kitchen & Bath Remodelers Pasadena CA"
Your video should be "Public"
Click on the "Advanced Settings" tab, leave everything as is and just add your Location. From here, the instructions get a little nuanced and it's actually easier to follow along via video. Luckily, there's a great tutorial showing you exactly what you need to do as next steps and it can be found below. Instructions for streaming start at the 12:47 mark. SEO is hard and it takes a long time. But for some miraculous reason, you can rank Youtube videos in 10 minutes or less and start moving more traffic to your site. You don't need to know a lick about SEO to do this as you can just follow the directions above along with the supplemental video. Experiment with it. Try finding the keywords that your competitors are not bidding on that you can take advantage of. And if you have any questions, let me know! I got my first one going with my new website. Plan on doing more for the services and locations next, but needed at least one to get started on my video channel with the main keywords for my home page. Just scroll a little down at http://www.chrisrigginsconstruction.com/. MOTB, thanks for the post since it reminded me to get back to you on this so I just sent a note in email too. Yes, all good. I saw the email and packaged a service video to be done for you in the upcoming weeks. I will also organize the Titles, Descriptions and Tags to be consistent with the web page objectives. Will keep you posted so you can then share with others too. That is great. Would you mind sharing a link to your YouTube channel since I was curious? Side Note: I went to click on the Website Link on your profile and it didn't bring up anything. Not sure if that was a mistake or not, but figured I would just make you aware since I was curious to see your channel and just wanted to jump to the YouTube channel to check out what is there. Yeah I get the "I saw one of your videos on Youtube" all the time. Youtube is great for local seo that's for sure. I like your custom thumbnails and also that you remember to include how to contact you at the end of the videos. And I like you used the Playlist feature too. For anyone who happens to be following me as a marketing educator, I highly suggest you click on Paul's link above since he "really" has momentum in this particular area. My instinct is his nearest competition will never be able to catch up since not only does he have a great library, but he continues to build over a period of time. I added this education to my Advanced Classes a few years ago. I remember when people first asked me about the possibilities, etc. Also, the reason I hope people glance at your channel is to see how relatively easy it is to address topics that are part of your day. These are not Top Notch Produced Videos, but they are focused on the issues and titled well, and end with the easiest ways to contact you. It is just the basics of video marketing (and these basics in deed allow you to stand apart from your competition). Thanks so much for sharing. Mix a lot what do you post on YouTube? I first started out posting project and before and after videos on to Youtube for my drywall and painting business in 2009. I would add titles and descriptions of what I was doing in the video for local seo. Everything from house painting, texturing, remodeling, drywall repair and texture matching. Which worked out really well. And still brings in many leads to this day. But with the views came many how do you do this or can you do a video of that in the comments of videos and emails from viewers. So my channel has kind of turned into more about helping Contractors and DIYers with drywall, repairs, texture stuff and painting. I basically just get video footage from actual jobs I do with either a GoPro or iPhone 6. I have around 200 videos uploaded to Youtube. One of my customers just did his first video using a Drone. He is a roofer and replaced a roof for a Historically Correct Mansion. We created a custom thumbnail and also embedded it into a new webpage for a location he is trying to grow in. Great use of his new drone.